Tonya Olsen has always had a passion for designing charming, budget-friendly rooms and projects. She loves to combine traditional interior design principles with personal, do-it-yourself flair. Tonya shares ownership of LIV Showroom, a full-service interior design firm and retail showroom, and holds a master’s degree in interior design. She is also the lead interior designer for Utah homebuilder, Rainey Homes. Tonya has over 20 years of professional design experience, bargain shopping fortitude, and do-it-yourself gumption. She spends her spare time gleaning inspiration from interior design books, magazines, blogs, and websites. Tonya and her husband have three boys and live in their recently renovated home in Bountiful, Utah. This is a visually stunning book. The pictures are professional quality and are a joy to look at. It is full of ideas for each room in your home, along with step by step directions on how to achieve the look. I found none of the rooms to be over-the-top Martha Stewart type ideas, but rather each is inspiring and stylish, with a look that is attainable for everyone. 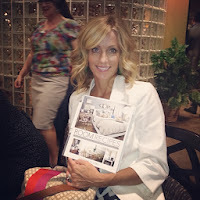 The author, Tanya, takes us to homes and shares different decorating styles. Tanya teaches us how to achieve the look, along with educating the reader on how to re-purposing common everyday items into sparkling gems! That is not to say the book was too simple, quite the contrary. The book is a gem. A must have. Each idea is laid out cleverly like a recipe. There is the Palette which sets up the patterns and colors for the space. Then there are the Ingredients, that lists the main items you will need for the room to achieve the look. Next is the Room Recipe, which are the step by step directions to making the room happen. And finally there is the Garnish, which offers simple how-to projects and decorating suggestion to top off the masterpiece. Room Recipes: A Creative and Stylish Guide to Interior Design is a book for people of ALL levels of decorating skills and tastes. It is a must have for your library. Enter to win a copy! !